(Trent Nelson | Tribune) Rep. Bradley G. Last and Rep. Brad R. Wilson, R-Kaysville, on Tuesday January 30, 2018. The federal government could shut down again on Feb. 16 — barring a compromise by President Donald Trump and congressional Democrats — but Utah’s state government will continue functioning for at least a year after lawmakers signed off on a series of base budgets Wednesday adding up to more than $17 billion. 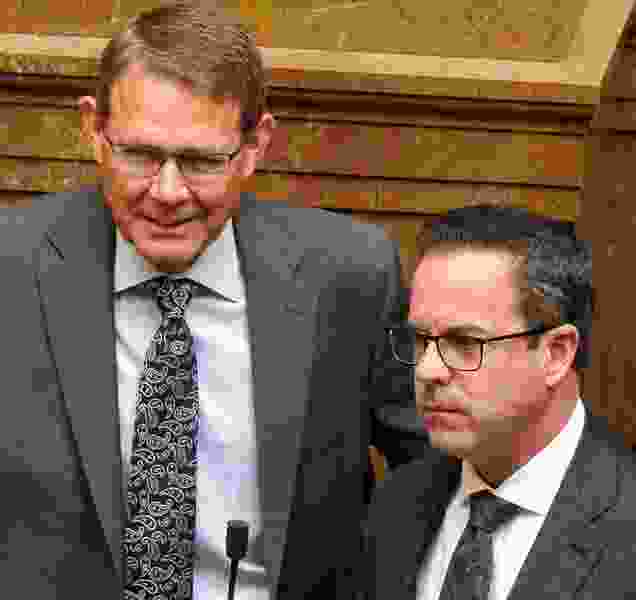 In what is an annual routine for the Utah Legislature, the bulk of last year’s spending plans were extended as a contingency while representatives and senators debate new spending priorities during the remainder of the 2019 session. Lawmakers began the practice after then-Gov. Olene Walker in 2004 threatened to veto the budget if lawmakers didn’t include money for an early reading program she championed. Each of the base budget bills passed with unanimous support in both the House and Senate between Tuesday and Wednesday. The votes followed minimal discussion, largely consisting of the bill sponsors giving a brief overview of any changes, or highlighting yet-to-come discussions on spending. The state is estimated to have a more than $1 billion surplus this year, largely in the Education Fund. Lawmakers have until March 14, the final day of the 2019 session, to determine how to use those excess funds. “The fun starts now as we begin to debate the surplus from last year and the projected revenue for the coming year,” Last said.